Take the stress out of planning Sunday school classes and activities with a subscription to Children's Worship Bulletins. In our extensive library of bulletins, you'll find a bulletin for every need — whether you need one based on this week's lectionary reading, a beloved Bible story or another specific Scripture passage. In this short article, we've included two Sunday school activities created from our bulletins about Joshua. These are just two examples to show you how easy it is to use Children's Worship Bulletins. Give each child a bulletin, a rock and markers or paint. Explain the activity, "In our story today, Joshua set up a large stone to help everyone remember the promise God made to Israel. While I read our story, please color/paint your rock so that you can remember God's promise." Read Joshua 24:1-3, 14-31 aloud while the children decorate their rocks. When the children have finished decorating their rocks, give each an index card to keep with their rocks. Explain the activity, "In today's story, we will learn about Joshua and what he did to remind his people about God's promises. Please solve the puzzle 'Joshua said the people must make a choice ...' in your bulletin. Then, we'll memorize this very important verse." 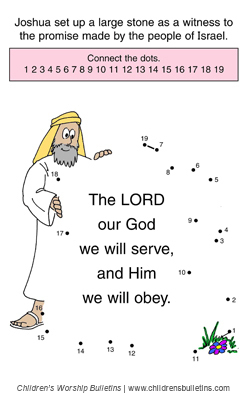 While the children solve the puzzle, write onto the white/blackboard the verse and reference, "But as for me and my household, we will serve the Lord" (Joshua 24:15). When the children have finished their work, explain how you will memorize the verse, "First, together we'll recite the verse and reference a couple of times. Then, I will erase one word, and we'll replace it with a clap of our hands when we recite the verse and reference again. Next, I'll erase another word to replace with a clap, and so on, until we've replaced all of the words in the verse and reference with claps. Finally, we'll recite our verse and reference one last time to make sure we've memorized it." Together, recite the entire verse and reference twice. Erase, for example, the word "household." Recite together the entire verse and reference, replacing the missing "household" with a hand clap: "But as for me and my 'clap', we will serve the Lord (Joshua 24:15)." Erase another word, for example "as". Recite the verse and reference again, replacing both missing words with hand claps: "But 'clap' for me and my 'clap', we will serve the Lord (Joshua 24:15)." Continue until you have replaced every word in the verse and reference with claps. Finally, recite the verse and reference without claps. Read aloud Joshua 24:1-3, 14-31 to reinforce the lesson. A membership to Children's Worship Bulletins includes unlimited use of any bulletin from our enormous library of bulletins that have been carefully built around Scripture from nearly every book of the Bible — Old and New Testaments. Looking for something else this week? No problem. Need to have a children's handout to go along with the pastor's sermon? We've got that too. With a subscription to Children's Worship Bulletins, simply go online, find a bulletin based on lectionary, Scripture reference or keyword topic, and download it in seconds! It's that easy! Children's Worship Bulletins make it easy to customize bulletins with your church name, contact information or logo. Rather than just handing children a generic handout, you can give them one of your bulletins, helping children to identify with and to feel like they belong in your congregation. The bonus? Bulletins with your church's contact information become an advertisement when kids take them home — something that they can share with others.